Living 2,000 miles from family can be tough around the holidays: who will you argue with over proper cooking temperature of a turkey or enjoy awkward drama with? The silver lining however, is a four-day weekend road trip to southern Utah that would still include all the trimmings. Over 30 of them to be exact. Gotta grab the touristy photo! Even though it was 60 degrees Laura refused to take off her LL Bean hoodie. Boulder is the middle of nowhere to some, but to others, it’s right smack in the middle of dozens of adventures sitting on the border of the Grand Staircase National Monument. 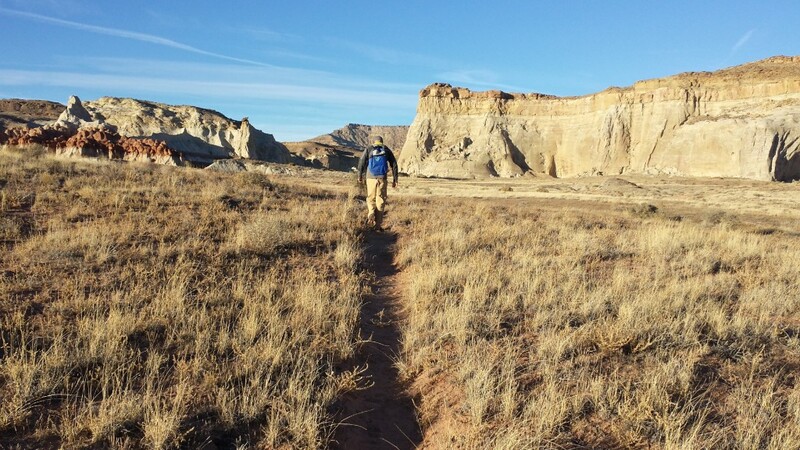 From hiking in Capitol Reef and the Burr Trail, to the 60-mile long Hole in the Rock road and its hidden slot canyons, Boulder has adventure all directions. 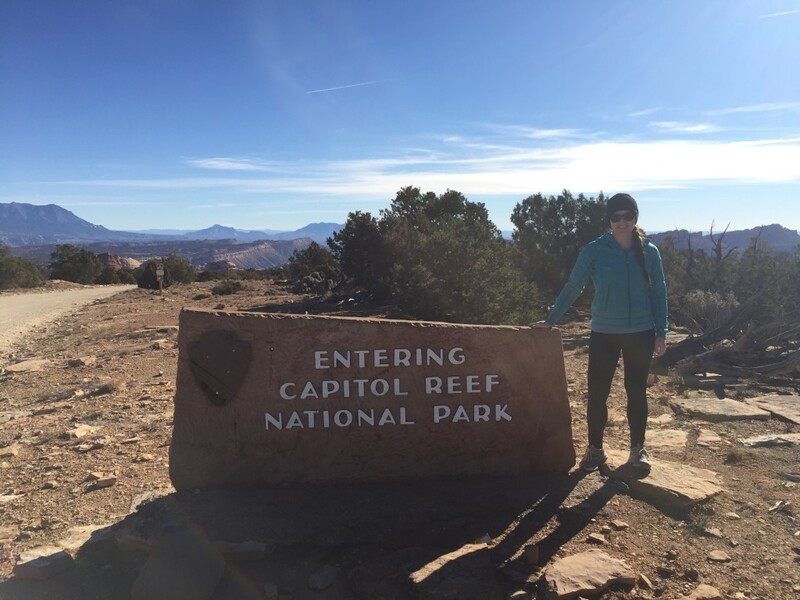 We chose to explore Lower Muley Twist Canyon in Capitol Reef to build up our appetite. 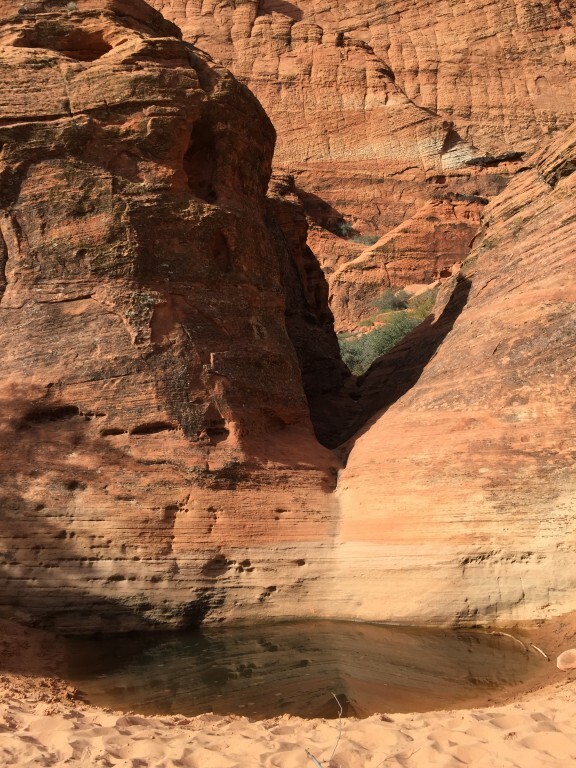 This sinewy canyon got it’s name from a rancher who quipped the path had so many twists and turns it could twist a mule. By the time we climbed the last hill back to the car, I was so hungry I could’ve eaten a mule. 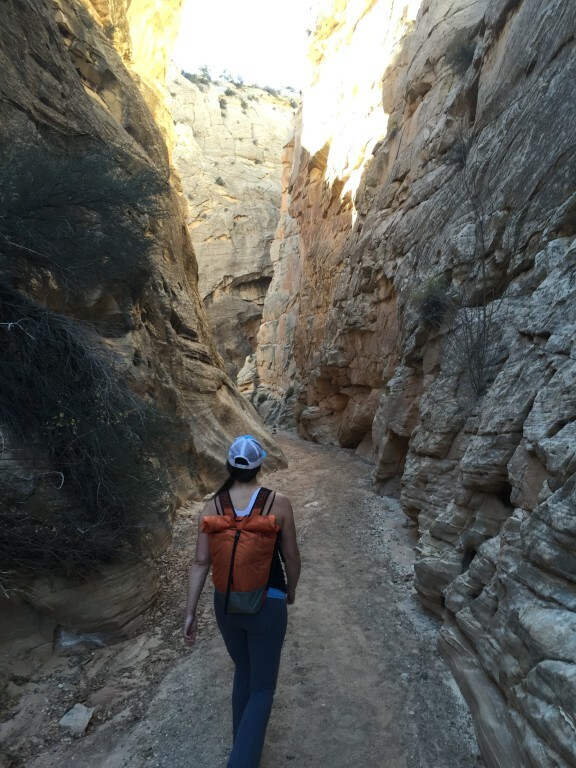 Laura on the return hike out of Muley Twist Canyon. “Some of you may be here with your families, or perhaps escaping them.” The crowd laughed to Blake Spalding’s welcoming remarks to the crowd seated at large communal tables of Hells Backbone Grill in Boulder, Utah. This destination-dining outpost has been the lone reason for a trip to the desert for thousands of people each year – an adventure in of itself. Only those with adventurous families typically make the trek for their Thanksgiving celebration. Or those of us not saddled with familial obligations; we fell into the latter group. 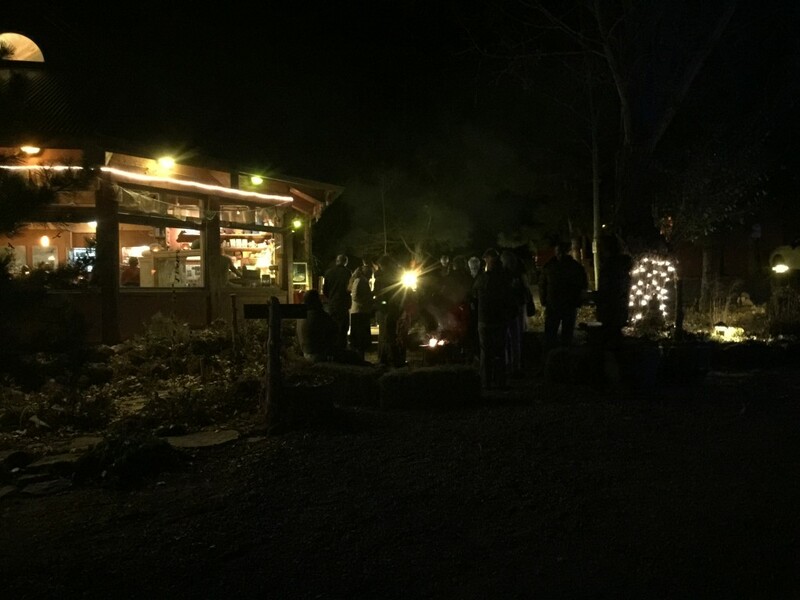 The evening begins with hot cider and passed appetizers around the fire pit just outside the front door. While the staff turned the restaurant over from the evening’s first seating, we sipped and noshed. This dining event has gained in popularity over the dozen plus years Blake and Jen Castle, the Grill’s co-owners and chefs, have hosted their spin on a traditional holiday table they offer two seatings on Thursday and a third on Friday. 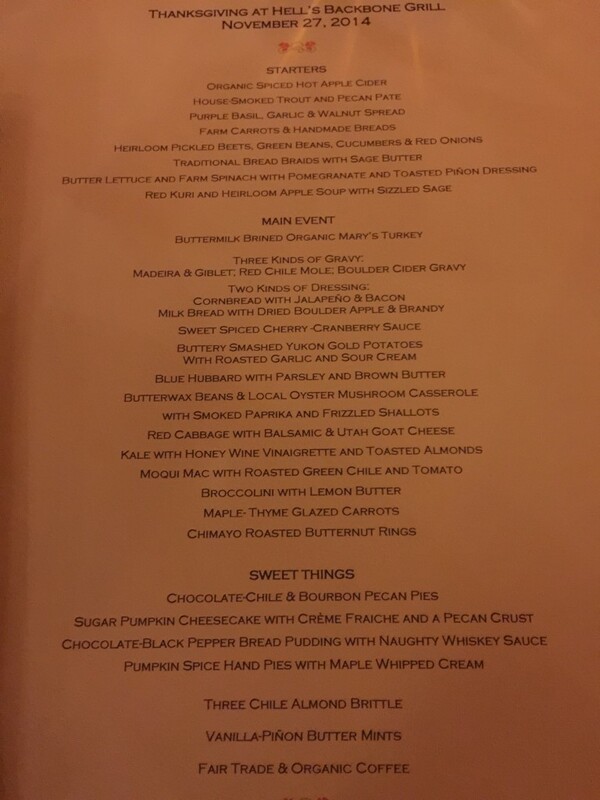 The menu looks like a typical Turkey Day menu, but with nuances these talented chefs throw in, it tastes anything but. Local turkeys are so much better than store bought “Franken-turkeys,” but when covered in the Hells Backbone made-from-scratch mole it’s out of this world. Attentive servers bring a platter of sliced turkey to the table, which is passed around clockwise by the dozen or so of our “dining family.” The trimmings come out one bowl or plate at a time immediately after, passed in the same manner, so each person can pile a plate. And pile we did. The Mac & Cheese, dubbed Moqui Mac, was bursting with southwestern flavors as was the jalapeno stuffing – easily our two favorite dishes. The aforementioned server obliged to bring second and thirds of each. As the calories piled up, dish by dish, I was glad I had hiked a dozen miles earlier that day. 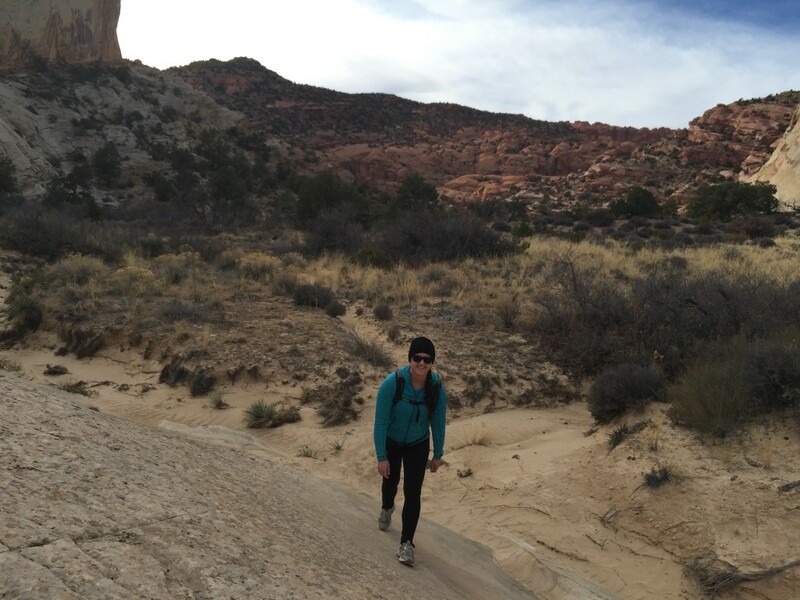 After merely scraping the tip of the iceberg for Boulder based adventures, we took off for St. George’s warm climate. 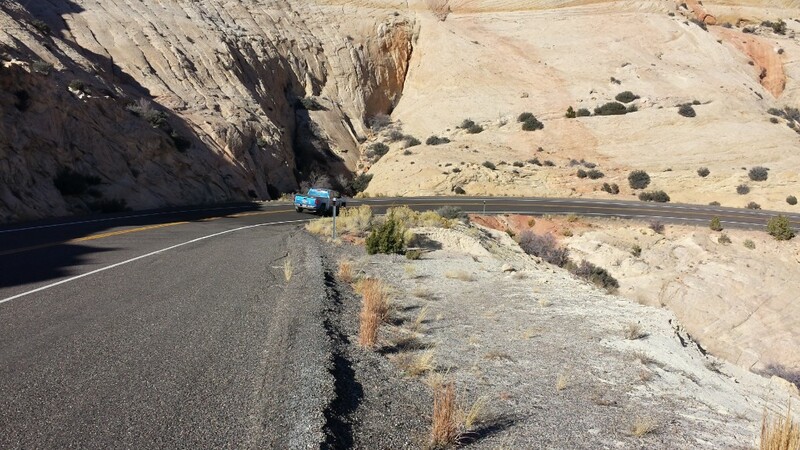 Traveling via a scenic drive that included Kodachrome Basin and a hike through the narrows of Cottonwood Canyon. This dirt road traverses Grand Staircase-Escalante National Monument made for a long day, but easily broken up with some quick leg stretching hikes along the way. Stretching to near the Arizona border outside of Page this backcountry road is as stunning as it is remote. By the time we reached St. George the temps were in the 70s and hiking uphill to a canyon pass in Padre Canyon was sweat-inducing work. Since the trails were practically empty, we could take our time and soak in the sun and scenery. Looping through Snow Canyon State Park avoided climbing back up the pass to return to our car and enjoy a flat walk back. With the sun still high in the sky, and more than ample climate, we went for a swim in the pool. Outside. In November. Long holiday weekends are the best. 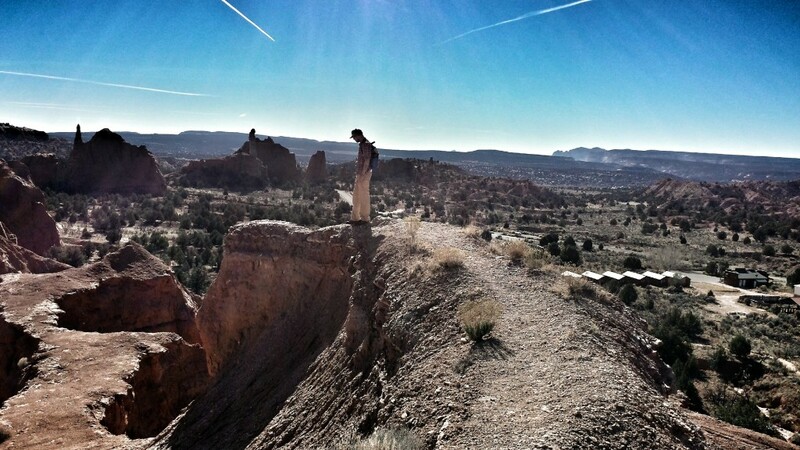 One of the many points on Kodachrome Basin you can test your nerve on. Short days means soft light around 4 PM. One of the “Three Pools” at the end of Padre Canyon, outside Snow Canyon State Park.